According to Business Day, protests erupted in Sharpeville on Tuesday when the news circulated that the speech would take place in Kliptown and not in Sharpeville. And in turn, a series of “service delivery” protests followed in other areas — a term I put in quotes only because some analysts, such as Steven Friedman, have argued that these protests have tended to be motivated by broader political agendas rather than specific gripes about service under-provision. The modern Sharpeville protest suggests the centrality of the politics of dignity. 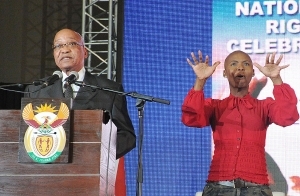 And with respect to the subject of human rights, various South African news outlets have been highlighting the contradiction between Zuma’s discussion of the importance of the constitution and the bill of rights on the one hand; alongside recent his administration’s recent moves to curtail free information, to review the constitution, and to question the integrity of the judiciary. In short, the question of which services and protections ought to be aspirations, and which ought to be rights remain the subject of active political conflict in the South African polity. And as part of that political struggle, protest remains a powerful and important citizen tool for voicing discontent, especially when the electoral system seems to offer little recourse. But I’m torn: Will today’s protests bring about stronger and more responsive democratic governance? Perhaps. But it also might backfire if such protests are organized at too low of a threshold, and if active engagement falls by the wayside as a strategy for realizing human rights and promoting better service delivery. My point is not to blame the protesters, but to wonder why the ANC continues to alienate its base, rather than drafting the citizenry as partners?